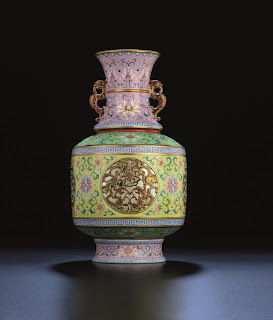 Christie's will auction a magnificent revolving vase from the Qianlong period (1736-1795) at its upcoming Hong Kong Spring Sale of Chinese Ceramics and Works of Art on June 1. Intricately decorated inside with symbols of happiness, longevity, prosperity and joy, the vase has reticulated outer walls and painted interiors, with a complex form and structure that exemplifies the technical brilliance of the craftsmen at the Imperial kilns of the period. As a few reticulated revolving vases were successfully produced in China at the time, these are extremely rare. The case is constructed so that the neck and inner cylinder are one piece, while the reticulated outer walls, base, and foot form the envelope within which it revolves. A porcelain cone placed in the centre between the bases of the outer and inner sections provides the pivot on which the latter is able to rotate. It would have been necessary that no part of the vases should distort during firing; that all the sections should shrink the same amount in the firing; and that the revolving section should not become stuck to the rest of the vase during or after the assembly process. Not content with making a vase that revolved, the ceramicists who produced this vase added a further degree of difficulty to their task by piercing the outer shell in order to create a reticulated pattern and to allow the decoration of the inner wall to be seen. The design of the reticulated roundels in the outer shell had to be very carefully balanced so as not to result in distortion or collapse of the outer wall during firing.